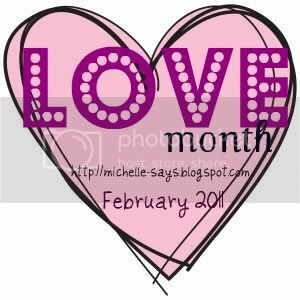 The wonderful Michelle of Fluttering Butterflies had the brilliant idea of hosting Love Month in February, to celebrate Valentine's Day. There will be reviews, guest posts, discussions and giveaways! My guest post for the month will be going up on 3rd Feb, so be sure to check it out. I will also be taking part on my own blog over the month. I don't know how exactly yet, but it's going to be good! Keep an eye out! Ooh this is the first I have seen of the button. It looks gorgeous. I must find out how she made it in the end. I'd like to know too! She did say she had no exerience of making buttons previously, so hoped it wasn't amateurish, but I love it! I can't do buttons that well! Lol. Thanks for the compliments on the button! I'm still not happy with it. *grumble* I used a stock photo of a heart and played with it in one of those image-editing things, just adding text to it. I wish I were better at the whole graphics thing, but I'm so not. Ooooh, clever! I thought the image came with the software! I love it though, I like the fonts used! :) I'm not too great either, even though I have had classes with photoshop, lol.